An infamous event in Britain’s colonial occupation of India took place a hundred years ago this week. 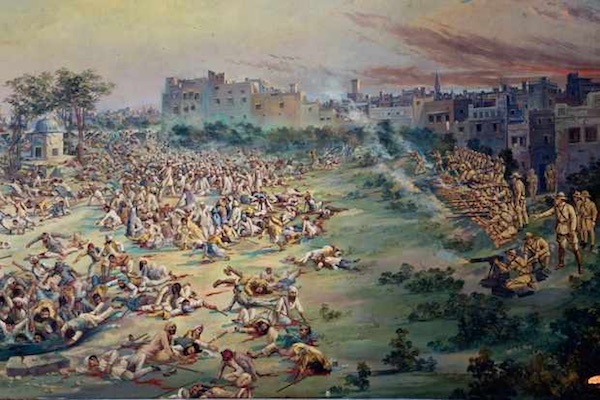 A historical account of the massacre at Jallianwala Bagh in Amritsar on Apri 13, 1919. By Archana Venkatesh of Ohio State University. British colonial reforms in 1919 endeavoured to “reward” the people of India for their participation in World War I by allowing more Indians in governance. Still, wartime measures to suppress civil liberties were kept in place. Known as the Rowlatt Acts, these measures ensured that police and armed forces could continue to imprison Indians without trial, suspend habeas corpus, and enforce prohibitions on public gatherings. In this way, the British Raj could take credit for bringing democracy to India while cracking down on political dissent. The Rowlatt Acts outraged the Indian National Congress, the leading nationalist party whose members included Muhammad Ali Jinnah, Motilal Nehru and his son Jawaharlal, and a man who would soon become very well known—Mohandas K. Gandhi. In 1919, Gandhi was fresh from his sojourn in South Africa and hoping to demonstrate India’s readiness for Dominion status within an Empire that he believed inherently just. The Rowlatt Acts and what would follow shook the faith of the Congress leadership. Were the institutions of the British Raj as honorable as Gandhi believed? Ironically, Congress’s reaction to the Rowlatt Acts mirrored some British reactions to the 1919 reforms. For instance, Michael O’Dwyer, the Lieutenant-Governor of Punjab, believed that the British were the rightful rulers of India. He was also seriously worried about the unprecedented unity between Hindus, Muslims, and Sikhs in Punjab at the time. Consequently, he enforced the Rowlatt Acts more stringently in Punjab than in any other province. Indian leaders who might give anti-Rowlatt speeches were summarily arrested. The slightest hint of anti-British sentiment was met with repression. Gandhi was banned from entering the province. British paranoia and Indian indignation rose to a fever pitch. Matters came to a head on April 13 in Jallianwala Bagh, a square near the Sikh Golden Temple of Amritsar. A small political gathering had attracted a larger crowd than was expected. It was the festival of Baisakhi and many had come to relax in the square after offering prayers at the Golden Temple. Colonel Reginald Dyer, an “old India hand,” who was born and raised in the subcontinent, led a group of Gurkha, Baluch, and Pathan soldiers towards the square. Dyer and his men faced a slight setback when the Colonel realised his armoured car (complete with machine gun) was too wide to enter the narrow passageway into the square (at most only four people can walk abreast). Forsaking the car, Dyer’s men entered the square and assembled into formation. Without any warning, Dyer gave the order to fire into the unarmed, non-violent crowd. As men, women, and children began to run in terror Dyer ordered his men to continue firing into the thickest part of the crowd. People began to jump into the square’s well in order to save themselves. Most of them drowned or suffocated under the weight of others jumping in after them. The firing did not stop until the soldiers exhausted their ammunition: 1,650 rounds. The numbers of wounded and dead are still unknown. Early estimates ranged from 291 dead (British officials) to 1000 (Congress report). After the massacre, Dyer, the “Butcher of Amritsar,” strolled back to his car and made his way back to the military camp. The response to the Amritsar Massacre was varied. Congress set up a committee to inquire into the massacre as well as the ensuing atrocities perpetrated by Dyer and O’Dwyer. It was only in October that the Hunter Commission (comprised of British and Indian men) formed to inquire into violence in Punjab. Dyer testified that the moral lesson imparted at Amritsar far outweighed any loss of human life. As he put it, “I thought I would be doing a jolly lot of good and [Indians] would realize that they were not to be wicked.” His only regret was running out of ammunition. Dyer continued to believe that he was the “saviour of India” until he died, and he was not alone. While the Hunter Commission and the United Kingdom’s House of Commons recommended his immediate dismissal, the House of Lords was more lenient. The British press had mixed responses, but The Morning Post hailed Dyer as the man who saved India, starting a subscription to collect funds for him and his wife to live out retirement in England. The subscription yielded a princely £28,000, of which nearly £9,000 was donated by British in India. The massacre and continued police brutality in its aftermath was a turning point in Indian anti-colonialism. Before 1919, the Congress Party’s activities focused on increasing representation for Indians in governance, and eventual Dominion status—an amicable parting from direct British rule. As Dyer was exonerated and valorised, Indian leaders realised that this was no longer possible. Udham Singh, who survived the massacre, saw it as his destiny to take revenge on those he held responsible. Nearly twenty years after the event, he assassinated O’Dwyer. At his trial, he was unapologetic, “for full 21 years, I have been trying to seek vengeance…I am not scared of death. I am dying for my country. What greater honor could be bestowed on me than death for the sake of my motherland?” Singh was condemned to death. The Amritsar Massacre one hundred years ago can be seen as the beginning of the end of British rule in India.